Software engineer at Square by day, CEO of the tech non-profit Elixir Labs by night. If this sounds kind of like the incognito cover story of a superhero to you, you wouldn’t be wrong. 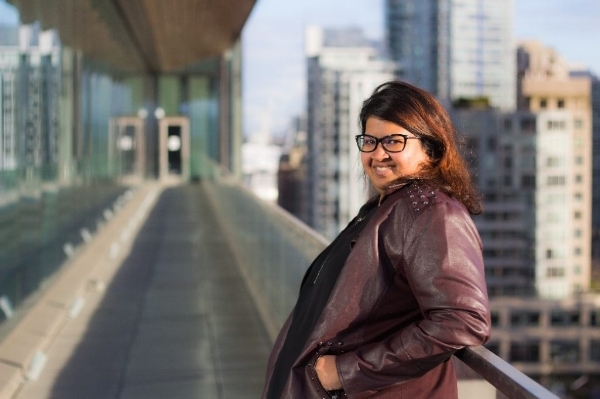 Aashni Shah is a wonder woman and her enthusiasm, dedication and passion for elevating women and girls in tech is not only infectious, but is also sparking real-world change. As described by her coworkers at Square, Aashni is “truly inspiring and without a doubt will inspire future generations of women in tech to make the same kind of impact she is.” Between her work at Square and the time she puts in at Elixir Labs, she’s also an active organizer and frequent speaker at tech events across the country, including founding UofTHacks, the largest student-run hackathon in Canada. We sat down with Aashni to get a little insight into how she’s making waves and breaking barriers, and how her community inspires her. [Talia Smith] Can you tell us a little about yourself? What does an average day look like for you? [Aashni Shah] I was born and grew up in a big Indian family in Kenya. Growing up in Kenya gave me incredible and unique experiences that have sparked my interests in travelling, photography and scuba diving. Philanthropy has also been a huge part of my life, from hosting fundraisers and feeding programs, to building schools and teaching kids how to code. I moved to Canada in 2011 to study computer science, and have since worked in four countries and six cities around the world. I’m currently working as a software engineer at Square in Waterloo (Canada), and am also the CEO of Elixir Labs. Three words I’d use to describe my interests are philanthropy, tech and travel, and surprisingly all three tie in with each other on a regular basis. My average day is split into my “work work”, and my “non-work work”. My “work work” is everything to do with being a software engineer at Square where I work on really interesting problems that are changing the way the world banks. My “non-work work” includes working on one of the Elixir Labs projects. I like to be an active member in the tech community as well, which means I’ll try to attend a tech event in the evening or prep for an upcoming speaking event. [TS] What attracted you to work in tech? Was it a life-long dream, or was there some other factor that attracted you to it? [AS] I loved math and solving puzzles from a really young age, and have always been passionate about wanting to help other people. For most of my childhood, I thought that being a lawyer was a powerful way for me to find a career based on my interests. However, when I started thinking about what to take for my undergrad degree before going to law school, I wasn’t interested in history or political science. Instead, I wanted to take computer science since I had learned how to make websites and thought HTML/CSS was the same as computer science (don’t worry – I know how wrong that assumption was!). I figured that by taking computer science in University, I would have one of two options; I can stay in tech and become a software engineer, or I could go to law school with a background in technology – something I knew we would need by the time I graduated. I ended up falling in love with software engineering because it allows me to work on really interesting and important problems, create socially beneficial tools and [be a part of an industry that is] constantly shaping the world I live in. [TS] There’s a lot of buzz around “building your community” as key to being successful in tech. What does your “community” look like? Who are the people you look for feedback from? [AS] A community should allow members to create a network of information to help each member achieve their goals. A community should also create a safe and open space to discuss issues members may be facing, and even drive necessary changes to make positive impacts for both members in and out of the community. I’m extremely grateful for the community I have, and know that I owe many of my accomplishments to the support that my community has given me over the years. I treat my community like a support network that I’m constantly trying to build and grow. This means attending events, meeting new people and offering help whenever and wherever I can. I’m especially happy that I’ve got many inspirational women in my community – women that I’ve either gone to school with or met at events I’ve attended or spoken at. I’m glad my community is diverse and includes people who have been in the industry for over 20 years, or are just entering university. A really positive sign that my community is a community I’m proud to be part of is that if someone reaches out and asks if I know someone who does X, I can usually introduce them to at least three people, and at least one of those three would be a woman. I have a different relationship with each person in my community, and I think that’s the right way to go about it. If I have more personal questions, I’ll usually ask one of my friends. If I have more career or technical questions, I can reach out to a professor, confidant at work or someone I’ve met in the industry who may be more skilled in a certain field. Aside from members of my tech community, I rely heavily on feedback and guidance from my family. They’ve been a big part of who I was growing up, and I want to make sure they continue being a part of who I become in the future. [TS] What barriers have you faced as a woman in tech, and how did you overcome them? [AS] As a woman in tech, I’ve faced many barriers such as not being taken seriously or [being] underestimated. I’ve had a recruiter try to convince me that I’m worth less than half of the average salary one would expect to receive as a software engineer. I’ve had a coworker tell me they don’t expect me to work past 5 pm because I’m a woman. I’ve been inappropriately hit on at events including one that was specifically designed to discuss women empowerment. I have even, sadly, been put down by other women in tech. It’s gross and unnecessary, and not something I’m willing to accept without a fight. I am also a woman of colour in tech. I view this as part of what makes me unique and lets me bring a different view to the table. This reason, along with my technical skills, make me a huge asset to any team I join. It’s important to remind myself of this whenever I face barriers because it reminds me that I have a lot to offer, and if a community or company can’t appreciate me for what I bring to the table, then they don’t deserve me. I have the right and ability to find somewhere that will only judge me for my skills, and will celebrate me for everything else that I bring to the table. Additionally, I’m a firm believer that technology is our most powerful tool and gives us the ability to make the changes we want to see in the world. With how much easier it is to access technology in today’s world, every underrepresented minority now also has the power and ability to lead these changes. The barriers we face today are better than the barriers we faced yesterday, a year ago, or even 20 years ago. It’s our change to break down these barriers and continue to make it easier for future generations. [TS] What does the phrase “diversity in tech” mean to you? [AS] Diversity in tech means working with people who have different backgrounds, experiences and interests. By working in a diverse team, you get exposure to new ideas which helps with innovation. It also helps us build and create tools not just for one demographic, but for everyone. Diversity in tech is simple. Politics and fear fuelled by misunderstandings make it complex. I hope that as we continue to break down barriers and increase communication, these misunderstandings and curbs the politics and fear and replace them with incredible new innovations and a better tomorrow. We would like to thank Amaris Gerson and Janelle Hinds for nominating Aashni and helping us share her story with the Women in Tech World community through our Voices of Women in Tech series.